New Bar Tops Manchester Airport: Versital Takes Off! North west based Versital® UK Ltd, specialists in bespoke solid man made surfaces, has completed a commission by Gariff Construction to produce and install Versital® marble bar tops at the Manchester Terminal One and Liverpool John Lennon airports. This two-phase £60,000 contract is part of recent refurbishment projects at these major UK airports. 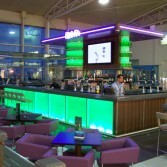 Orangepeel Design Ltd, designers responsible for the new departure lounge bar at John Lennon Airport, chose versital over the original planned zinc surfaces due to its more favourable cost, production time and ease of maintenance, combined with an ability to imitate the gun-metal colour of zinc. “Hand-crafted versital moulds were used to create the intricate seamless curves and shapes of new bar tops, balustrades, shelving and podium table-top surfaces. It met our exact specification of the design framework, whilst keeping the modern effect we intended and complementing the surrounding colour schemes.